Am I Ready to Take My Drive Test? I picked up Marina, a 19 year-old college freshman who was learning to drive. This was her first driving lesson with an instructor but she had driven with her older sister a few times. Marina seemed eager to “prove” to me she was already a good driver so I would give a good report to her father, fast-tracking her path to that all important California driver’s license. Only one problem, she wasn’t a good driver. Although she could operate my car with relative ease, she quickly learned that “operating a vehicle” and “driving a vehicle” are quite different. Knowing how to stop at a 4-way stop-sign intersection didn’t give her the understanding of when it was her turn to go, the confusion and resulting close calls were immediately apparent. Our entire lesson was filled with examples of these confusions relating to many different aspects of the driving experience. When the lesson concluded, Marina looked at me with a big smile and asked, “Do you think I can pass my driving test”? “not being a competent driver” were presented during the lesson? Because she didn’t know what she didn’t know. “If your university offered you your 4-year BA / BS degree certificate right now without having to complete the next three years, would you accept it”? Without hesitation she answered, “absolutely not”. “I wouldn’t have the knowledge or skills I would need to pursue my career”. I told Marina that since she would have a BA / BS certificate to show she was qualified, she could still pursue her career and her response was, “But I wouldn’t know what I was doing so it would be a very short career”. I smiled and said, “Well, the minimum qualification to pass a drive test is like getting a 4-year degree after only one year but with one difference……if you don’t know what you’re doing in a car, it can kill you. 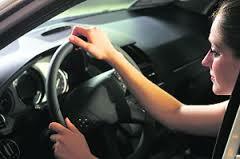 The drive test is only about 8 minutes and does not test the competency of a driver”. Marina’s smiling face transformed into a more serious and concerned face….she was really thinking about what I said. I hope Marina stops looking at the driver’s license as the goal and starts looking at becoming a 5 Star driver as the goal, her life may just depend on it. 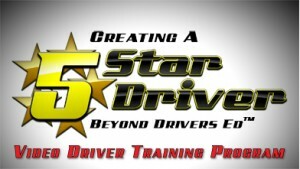 Creating a 5 Star Driver…Beyond Driver’s Ed™ Driver Training Video Series.